If you had your own stein at the beer hall, would you have been one to wonder how you were assured of getting your own stein back when it was refilled? At the Hofbräuhaus in Munich the steins are numbered. I even have the original receipt for my HB stein dated November 12, 1898, shortly after the article below was published. 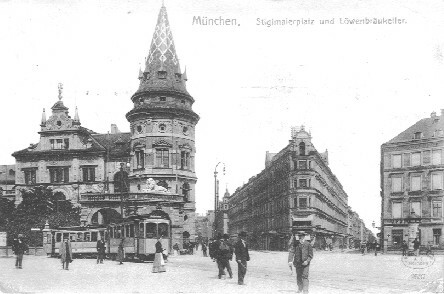 But what about the other beer halls (such as the Löwenbräukeller shown in the post card above) that might not number their steins? 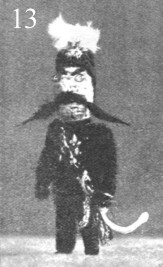 I found the answer on Ebay when I spotted an item described as "1897 Beer Markers Puppets for Steins Unusual!" The article below first appeared in The Strand Magazine in 1897. The Strand Magazine was founded by Georges Newnes (I presume the same one that provided the photos in the article) and published from 1891 to 1950. Maybe you remember it as the magazine that published the Sherlock Holmes stories. It will now be remembered as the magazine that gave us a new "go-with" collectible to seek for our beer steins. The article is quite interesting, but raises new questions. Did this fad die with the little old lady that knitted them? Who will be the first to discover one of these gems? Enjoy the article, I did. All roads in Germany lead to Munich, where the beer comes from, and all roads in Munich lead to the Löwenbräu Keller, where we got these beer-markers. The Keller is a noted place, possibly not so celebrated as the Hofbräuhaus, or Court Brewery, where the special brew of the Bavarian dignitaries is doled out in foamy quarts and pints to the populace; but in its own way it is unique. It is an enormous hall gaily decorated in evergreen, closely packed with tables, at which natives and visitors sit in loving communion over their "bock," while the band plays. The tunes are good, and the solid contentment of the crowd is sweet to look at; but the beer-markers, in the words of the poet, "take the bun." and a fancy stein with Caprivi perched on the thumblift. 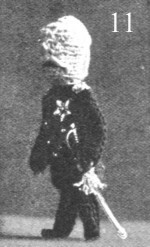 To describe them briefly, they are little puppets of knitted wool about four inches high. Now, at the beginning of this article, you will find two pictures of beer-mugs, with the beer-markers stuck fast upon little metal knobs at the top of the handles. The markers are placed there by the beer-drinkers, so that, when the mug goes out to be refilled, it will come back to its proper owner. Each man, therefore, by simply placing his beer-marker upon his mug, always gets his own mug back, and not somebody else’s. The pretty Kellnerin, or waitress, is a very careful woman, but as all the mugs in the Löwenbräu Keller are alike, she might get them mixed up in the shuffle if the drinkers did not co-operate with her to make mistakes impossible. The photographs reproduced on these pages will show the variety of the markers. They are nearly all caricatures of the prominent people of the time, as well as a few local figures, unknown to the great world – but about them all there is an excellent likeness to the originals. But let us to the markers. First and foremost stands the Kaiser (3). Note his darting eye and his majestic air. A born ruler, with his manly breast covered with emblems – made of tin. His brown-yarn mustaches sweep across his face as if they wanted to kiss his ears while a faint tinge of red paint gives colour to his fat cheeks. 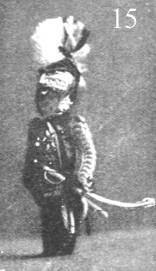 The little figure is carefully made, and the Kaiser grasps his sword as if he were showing his troops the proper way to fight. Beside the Kaiser, where the great difference between the Teuton and Slavish features may be seen, we place the Emperor of Russia (4). Now, very few people will believe us when we say that this is the Czar, but it really is. The likeness, however, is very poor. The Czar looks aged and distressed. 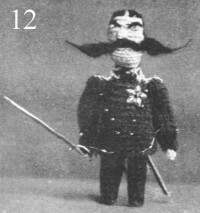 Possibly, the knitter made him so on purpose, as a sly dig at the Czar’s late hobnobbing with la belle France. We place Bismarck next (5). After him comes Windthorst (6), the German statesman who died in 1891, and then Eugene Richter (7), the Radical leader of the Reichstag, or German House of Commons. When Bismarck was the first figure in Germany, his two greatest political enemies were Windthorst and Richter. If Bismarck wanted a canal dug or an army raised, his opponents were sure to say they weren’t needed, and at last the fight got so hot, that if Bismarck had asserted that the Atlantic Ocean was filled with water, the others would have said it was made of mud. Hence, we mention these nobilities together. Note Bismarck’s three hairs. They are all he has in the world, and the woman who knit the "Iron Chancellor" did not forget a single one. Mark also Richter’s portfolio under his right arm, and his gold watch-chain. And before passing to Ferdinand, note Windthorst’s chubby face and expansive mouth. This (8) is Ferdinand of Bulgaria, whose little son, Prince Boris, lately stirred up a lot of excitement for his size, by being admitted to the orthodox faith. In all the caricatures of Ferdinand, you find him adorned with an enormous nose, and in this beer-marker the proboscis stands prominently out. There is nothing more to say about Ferdinand, except that his uniform is made out of blue wool. Indeed, all the beer-markers representing German military men are in blue. The editors and statesmen are in inky black. Here (9) is an editor, with wise and knowing eyes, and a pen behind his ear. Doubtless Dr. Sigl is unknown in England, but in Munich, where he edits the Catholic paper called the Fatherland, he is a noted public character. Sigl is a great opponent of progressive or Radical movements, and advocates the separation of Bavaria from the German Empire. His mustache shows true editorial training. Herr Ahlwardt, the pompous and well-fed-looking individual who bears down upon us in (10), is a pugnacious anti-Semite who has figured prominently in the Reichstag. Once in a while he gets thrown into gaol on account of the nasty way he says things, and his popularity is as considerable as a mustard-seed. Many of his accusations against the Semites have been proved unfounded, and this has not added to his reputation. But he makes a jolly handsome beer-marker. Our next reproduction shows Caprivi (11). We also see him upon the fancy mug (2) on the first page of this article. Caprivi succeeded Bismarck as Chancellor, but did not stay in power long. There was a dead set against his policy from the beginning, but during his short term of office he became noted throughout the Empire. This beer-marker is not half so effective as that of Lieutenant von Brüsewitz (12), who has lately set the tongue of Germany agog by killing a civilian in a duel. 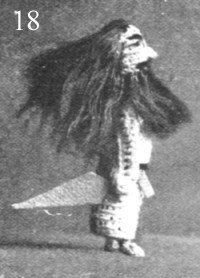 Brüsewitz is more or less of a military bully, and his opponent is said to have been guilty of no offence. Hence the stir. The people rose against him and pleaded for his punishment, but, at the time of writing, little has been done. With such a reputation, it is but natural that he should be represented in a defiant attitude, and that his mustache should have an angry spread. The Shah of Persia and Emin Pasha. Like Dr. Windthorst, the Shah (13) is represented with gold spectacles. 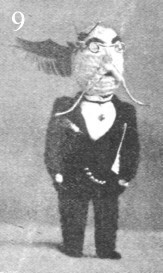 It is, however, not the present Shah, but the late one - he who was once the pet of the English ladies. 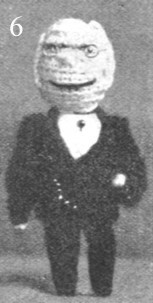 Most of them will quickly recognize him here as a friend. Emin Pasha (14) was a popular beer-marker in the days when he was fighting in the Soudan, and trying to bring glory to the German arms. Boulanger’s brilliant figure (15) was also frequently seen on the beer-mugs, in the time of his short-lived leadership. His red trousers, blue coat, and beautiful white plume made a very gay appearance. At the present time, one of the most caricatured men in Germany is Father Kneipp (16), the noted preacher of the "Kneipp cure." Kneipp’s theory is that nervous troubles may be cured if people will systematically promenade with bare feet in the early morning dew. The beer-marker shows a philanthropic face and a watering pot, from which latter the good Pfarrer obtains artificial dew. Here let me add that the "beer-marker" custom has been known to Munich for many years, and that it has been adopted in nearly all of the German cities and towns. In the Löwenbräu Keller the markers are sold for fifty pfennige, or sixpence, each, by an old woman who goes round amongst the beer-drinkers with a basket. 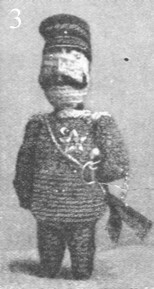 She is a well-known character in Munich, and knits the figures herself. The list of great men would be incomplete if we did not have Prince Luitpold, the ruler of Bavaria, amongst them. For the Bavarians are proud of their land, and look upon their Sovereign as equal to the Kaiser any day. Well, here is Luitpold (17), but he wears a slightly uncomfortable look, as if he felt himself a makeshift for the real ruler, Otto, who is said to be insane. The Munich people are particularly fond of the little figures which represent characters of local reputation. Herr Tiefenbach (18) is one of these. He is a local painter who attracts great attention on account of his curious attire. He has long, flowing hair, wears large spectacles, a long ulster, and constantly carries an umbrella. When he walks down a Munich street he is always followed by a crowd. Our reproduction gives an excellent idea of this most curious mortal, whose reputation in Munich art is of the highest. There still remain four beer-markers – the best of the lot. Look at this pretty Kellnerin, with her gay bodice and her two beer-mugs (19). She is a familiar figure to the Germans; but, with all her beauty, she is inferior to our own national institution – the British barmaid. 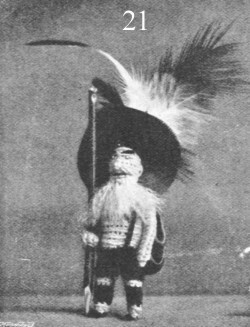 Here, also (20), is "Wurzl," the old vegetable woman, with a giddy carrot in her right hand, and a knobby nose that almost touches her chin. She is not a thing of beauty, and wears the commonest of clothes, but "Wurzl’s" heart is always in the right place. We also get a view of "Wurzl Sepp," who, next to the Kaiser and Bismarck, is the best-known man in Germany. He is a queer old fellow, a hermit, in short, who runs an illicit still among the mountains, and who may frequently be seen in this most picturesque costume (21). A short time ago he was seen at the Berlin Exhibition. Last, but far from least, the Münchner Kindl. 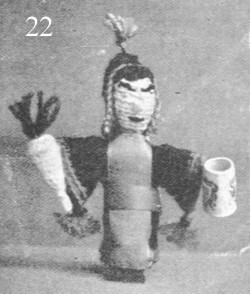 Lastly comes a little beer-marker in a long robe and hood, with a radish in one hand and a beer-mug in the other (22). We have already seen him on the top of the Löwenbräu mug (1). 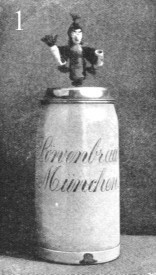 He is called the Münchener Kindl, or "Munich child." By some mysterious chain of events, in the olden time the arms of Munich became a little monk, or Mönchen, from which we get the German München, or Munich. Now, the little monk always held a Bible in one of his hands, and raised the other in exhortation. But in the Löwenbräu Keller, we find him with the radish and the beer-mug. The radish, it may be added, is an indispensable accompaniment to a mug of beer. It is cut lengthwise in long, thin strips. It is then opened like a book, and each leaf is sprinkled with salt and then closed again. In a few minutes it is taken up in the fist and well squeezed, when the water runs out of it in streams, like the juice of a lemon, the flesh becomes soft and flabby, and the radish is ready to be eaten. It lies on the table beside the drinkers, and with it the bock becomes nectar. So much for the radish in the hand of the little monk.